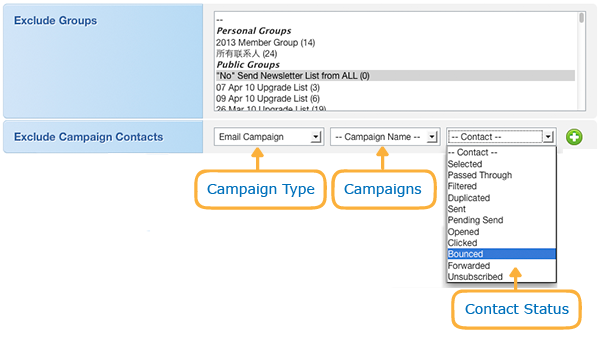 When you create an email campaign or a sms campaign, you can exclude contacts, modify notifications or tune other campaign configurations in Advanced Settings. You can exclude [Groups] or past [Campaign Contacts]. If you exclude past [Campaign Contacts], you have to choose the campaign and the type of contacts to be excluded. If you exclude a [Running] or [Pending] campaign, the dependency on the status of the excluded campaign may cause your campaign to start later. 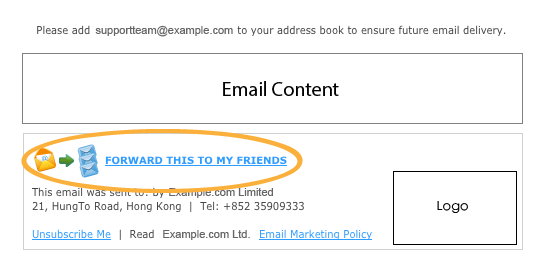 For example, if you exclude the [Sent] contacts in a [Pending] campaign, your present campaign will not start until the excluded campaign begin to send. 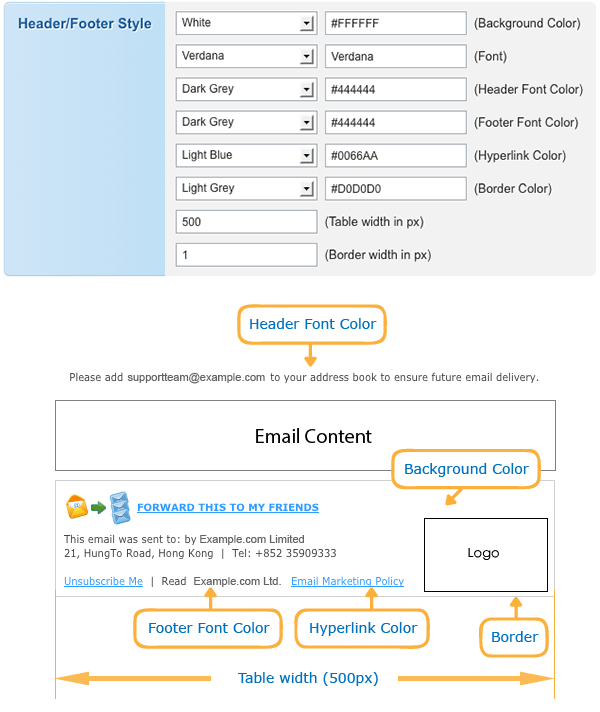 Set the style of email header and footer. The message counter in SMS editor just counts character and indicate consumption before personalization (mail merge). If you have applied a personalized field, actual message size may increase and may vary among messages. To give you better control over credit consumption because of overrun messages, you can choose 1). send full message; 2). skip overrun messages or 3). chop content, so that the system know how to deal with messages exceeding the displayed size. Notifications can be setup to report email and sms campaigns progress. Email notification costs you nothing while sms notification is charged as sending one sms message. When you run out of sms credits, no sms notification will be sent even if you have enabled the option; so always be sure if you have enough sms credits. After you save a campaign, normally a final send list is generated immedately. Target group contacts are extracted, unwanted ones such as hard bounces and unsubscribes are excluded. This checking process is known as [Campaign Compilation]. For [Scheduled Campaigns], you can let the system execute this procedure at the last minute. Future contact / group changes will not affect saved campaigns. With no compilation at due, campaign starts sharply as expected. Up-to-date contacts / groups are used. Contact / group changes during the waiting period can never be reflected in the final send list which has been snapshotted earlier. The final send list may be different from your expectation as contacts may be altered / added without awareness during the waiting period. Campaign may defer to start as checking can only be done at the last minute. Filter duplicated email address (email marketing) or mobile number (sms marketing) in your groups so that any duplicates will be sent once only. With this, When a recipient receives your email, he/she can see his/her name along with his/her email address in the [To:] field. If you enable delivery period control for a campaign, the campaign will be limited to send in specific periods only as declared in the Delivery Timetable. Learn more about Delivery Timetable. Generic email addresses, such as those started with info@, sales@, enquiry@, hr@, admin@, etc, generally denote specific email lists of a company which they are never regarded as personal addresses. 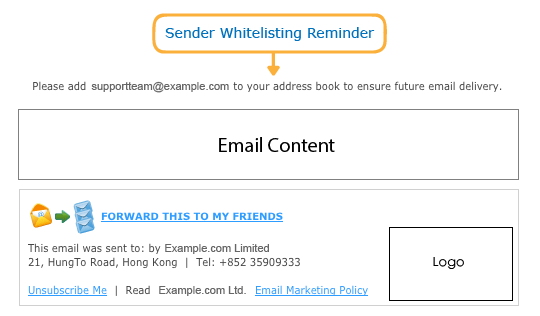 Bulk mailing to them are prohibited in our anti-spam policy which may also risk classification as spamming activity by your recipients, blacklisting of your sender address and banning of use. This option is checked by default. Unchecking this filter may result banning of use. Proceed only if you know what you are doing.